I’m kidding of course, about the snail’s head…………….sort of , but I don’t think he was included in the surveying, even though it fits nicely with everything else. This was the Dodmen’s Temple, and in England, a snail is sometimes referred to as a dodman. While watching a snail in his garden, Alfred Watkins wondered why they were called this. Then he noticed its antenna, which look like small sticks with balls on the ends. And like all other antenna on animals, snails can move them around. He realized that the ancient surveyors would have used staves for their surveying, and they would have been moving back and forth trying to get their sightings straight on. Their heads would have been the balls. Snails are among the few species of animals which have both terrestrial and aquatic types. Snails also leave a luminous white trail. When the ancient surveyors created their track ways, they included flash ponds and beacon points along the way, making them luminous at night. The Queen/Quin/Gwyn Stone likely had torches in some of the grooves at night, making it a beacon after dark. The Altar stone may have symbolized the start of this luminous trail. Snails seem to have played a bigger part in people’s lives in ancient times, and not just to eat. They were used for jewellery, decoration on clothing and baskets, certain types were used for dyes, and likely for many other things as well. Such as ‘beaded’ curtains to go over doorways or windows. They give privacy while helping to keep out the insects and allowing in the fresh air. The Aztec Moon god was, Tecciztecatl, and he had a snail’s shell on his back. Among the Aztec, snails were connected to the Moon and rebirth. But at Chichen Itza, there is El Caracol, The Snail. This very impressive tower was used as an observatory. The windows in it were used to observe the Equinoxes and the Summer Solstice. In Mesoamerica, there is also Viracocha, the Staff God, another astronomer/surveyor. The Welsh word for a snail is, malwoden. That definitely caught my eye in the dictionary. Investigating a bit, I found that an obsolete meaning for, mal; it means, as or like. So, As Woden or Like Woden? No, woden, in the Welsh dictionary though. A modern meaning for, mal, is a mill. Isn’t there a saying, “The mill of time grinds fine”? If it was As or Like Woden, then it just means that its shell goes round and round just as the Sun seems to do to the Earth. The mill of time can also refer to the Precession of the Equinoxes, which also go round and round, only over a much longer period of time. The 72 years which were being kept track of at Stonehenge had to do with precession. It takes 2150 years to pass from one sign of the Zodiac to another. When the original part of Stonehenge was built, the Sun rose in Taurus on the Vernal or Spring Equinox, and all the other important days of the eight divisions of the year had their own sign in which the Sun rose. When Taurus gave way to Aries, all the other divisions of the year also shifted into a different sign. This shifting from one sign to another has always been viewed as a time of chaos, because suddenly all the seasonal sky formations were different. The most important were the two Solstices and the two Equinoxes. The Constellations the Sun rose in at those times were thought of as the Four Pillars of the Earth. When things moved from one sign to the other, the Pillars were thought of as collapsing, and a whole new framework would have to be constructed. The framework being the four new Constellations. So the snail is not quite so silly after all, and is connected to astronomy. In the picture below, you can see how one looks all stretched out, the back-end of the body is narrower than the front. The Sarsen Circle sits right in the middle of the Station Stone quadrangle, which is narrower on the opposite side from where I drew his head. The stringing on the diagram above may look a little over the top, but looking at the Dulcert Portolano, a map dating to 1339, I can see that this was used as a mapping device. Most of the old portolanos were constructed using much older maps. The Piri Re’is Map dates 1513 and shows Antarctica. The World Map made by Orontius Finaeus, dated 1531, shows all of Antarctica, and a great deal of it was shown without ice. The coast is shown as ice-free, and there are mountain ranges and rivers shown open to the ocean. This hasn’t occurred for thousands of years, and yet this map is fairly accurate according to modern scientific study, and must have been mapped by someone when it was in this condition. The Antarctic wasn’t discovered by modern mariners until 1820. The Piri Re’is Map shows all of South America in 1513, but Francisco Pizarro only went from Panama to Peru in 1530, and the Spanish never explored south or further inland for quite some time after. All of which goes to show that there were people sailing the oceans a very long time ago. At the moment, who they were is a mystery, but they do seem to have passed on their knowledge, since such details still show up in the 1500’s. There is a theory about Earth crust displacement, which suggests that the Earth’s crust ‘slipped’ south, and that Antarctica, which seems to have had a temperate climate at one time, was displaced south by 2000 miles or 30° of arc. Everything else was displaced also, Europe would have slipped south and Alaska north. It’s known that Alaska and other places on Earth which are the frozen north now, where in a temperate zone, while a great deal of our current temperate zones were under ice. This sudden displacement may have caused the end of the last Ice Age, c11,000 BCE. There would have been massive flooding after, volcanos erupting and violent earthquakes. The land, freed from the heavy burden of ice, would have rebounded and heaved upwards causing more earthquakes, volcanos erupting and flooding. These disruptive events may have continued intermittently for several thousand years, as the land settled into its new position. Doggerland started to sink lower and some flooding occurred, starting c6500 BCE. The Storrega Slide off the coast of Norway caused huge tsunami waves which flooded large portions of Doggerland c6200 BCE. Only the area now known as Doggerbanks would have been left, and that would have been cut off both from England and the Continent. Within a thousand years Doggerbanks was totally flooded, and nothing remains of that very large piece of land, only Heligoland, the North Sea and the English Channel are there now. At one time this area may have been Europe’s richest hunting ground, many animals roamed this area. There were also marshes filled with all sorts of birds. People had settlements there, and likely many died in the tsunami. It is in the period, starting c11,000 BCE, that mass extinctions of many animals occurred, and an almost mass extinction of mankind also. If there were already high civilizations before this episode, they were likely wiped off the map, and mankind went back to a much reduced way of living. But among the survivors, there must still have been mariners, astronomers, surveyors, architects, mathematicians, healers and other well-educated people, who continued to pass on their knowledge. The sky would have seemed in total chaos, absolutely nothing would have looked the same up there. Observations would have had to be made from scratch again. Just as mankind had to start from scratch again. We hear echos of those times in ancient legends which exist among all people on Earth. We also hear about The First Time, The Golden Age, when gods trod the Earth. But they were not gods, only survivors of a much higher civilization that once existed, possibly on Antarctica. In Egypt these people were known as the Neteru, they brought agriculture, animal husbandry, mathematics, writing, astronomy, healing and all higher learning. It took some time for everything to get rolling again, but once it did, sophisticated civilizations suddenly appear. As if by magic, mankind went from Stone Age hunters, gatherers and homestead type farmers, to building cities including houses, temples and palaces, filled with rulers, priests and priestesses. There was suddenly all types of art, writing, religions complete with a pantheon of gods, and a keen knowledge of mathematics, surveying and astronomy. Returning to the diagram above, this Square of Enlightenment has 28 lines coming from each one of the corner posts, and going to 28 separate Aubrey holes. Even the Y and Z holes look as if they were laid out by these lines. The only place on this whole net where you can construct an equal angled octagon is around the Sarsen Circle. The other two eight sided figures are no longer true octagons, and don’t sit at line conjunctions very well, whereas the true octagon does, and so does Lugh. Any stringing mistakes are mine, not their’s. The ratio between the side of the square, and the long side of the larger rectangle, is the same ratio between an Egyptian royal cubit and a common cubit. This is really not that surprising, since a great deal of Egyptian mathematics has been found there. 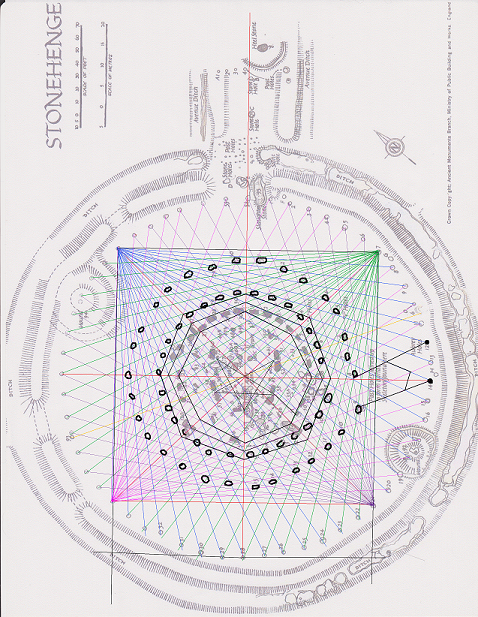 “The Stonehenge Codes”, by D. P. Gregg deals with this in great detail. Since this is a mapping device, and such detailed maps were usually only used by mariners in ancient and not so ancient times, it would seem that there is just a little more than a faint smell of salt water here. Stonehenge and Bluestonehenge are connected by the Avenue, and the Bluestones, which connects them to water and sailors. Even the way Lugh’s head was raised, is very much like hoisting a sail. Manannan was a sailor and merchant, so it shouldn’t be any surprise to find sea connections at Stonehenge. Ancient mariners were astronomers, that’s the way they made their way around at sea. Mariners also used to take sightings of the Sun’s position at noon, and at Stonehenge this sighting was done with the line of light which appears on the ground between Sarsen 11 and Trilithon 53-54 just before noon, not only giving them the time of day, but also giving them longitude, since the line of light sits N/S. The builders of Stonehenge were full of little tricks. Although Lugh has the correct angles I found for him originally, one of his legs doesn’t quite make it to one of the Trilithons. However, the Trilithons were set up to correspond to major events of the Sun and Moon as seen from within the space of the Trilithon Horseshoe, and through the openings between the uprights of the Trilithons, and the openings between the Sarsen uprights in the circle. The Great Trilithon may have had a space of three feet between the uprights, but the other Trilithons only have 12-16 inches of space between the uprights. This narrowed the view considerably, and you would have to stand in one spot to see the Sun or Moon event through these openings. Each spot would have been different for each event, but because of the narrow opening, there would only be one place to stand for these sightings. One step ahead or one step back would take away the sighting. The opening in the Great Trilithon is greater because the Summer Solstice Sunrise line does not correspond with the Winter Solstice Sunset line, although I am showing only one line. At Sunrise on the Summer Solstice, the Sun would cast the shadow of the Bluestone in front of the Great Trilithon through the opening. Winter Solstice Sunset appears between the Great Trilithon uprights, and the shadow of the Bluestone would be cast onto the Altar stone. According to Gerald Hawkins, Winter Solstice Sunrise could be seen through the openings of Trilithon 51-52 and Sarsens 6-7. Summer Solstice Sunset could be seen through Trilithon 59-60 and Sarsens 23-24. Both maximums of the Summer Moonrise, that is the full Moon closest to Summer Solstice, could be seen through Trilithon 53-54, but the Minor position would show through Sarsens 9-10, while the Major position would show between Sarsens 8-9. On the other side, Midwinter Moonset could be seen through Trilithon 57-58. The Minor position through Sarsens 20-21, and the Major position through 21-22. On the above diagram, are two more reasons why I think he is meant to be Lugh, at least at some point in time. The Winter Solstice Sunrise would have thrown a beam of light on his ankle. Lugh/Lugus was very popular among shoemakers, he was considered their patron. Among the Celtic artifacts, there appear ankle length pottery and metal boots. They have always been found singly and never in pairs. They’re Lugh Shoes. The Equinox Sunrise beam would hit him in the thigh. Lugh/Llue’s wife, Blodeuedd, and her lover Goronwy conspired to kill him. The only way he could be killed was if he had one foot on the back of a goat, and one foot on the edge of a bath tub. The spear to kill him had to have taken a year to make. Eventually they meet all the conditions and attacked Lugh/Llue, he was injured but not killed, instead he flew up into the air as an eagle. On Equinox Sunrise the shadow of one foot would be thrown onto the Trilithon, the goat, and the shadow of his other foot would appear on the Bluestones, the tub of water. The spear was the shaft of light, and since Blodeuedd is connected to Spring, this would make it the Spring Equinox Sunrise. This story may be connected to something which happened at Stonehenge when the Temple was being built. Someone may have wanted it to be Equinoctial rather than Solstitial. Obviously they didn’t get their way. After stringing all their lines, they would have put small stakes at the corners of the octagon, and possibly at the corners of the smaller eight sided figure. Stakes would have marked the top point of Lugh’s head, and at the angles of his hands and feet. All the Y and Z holes would have been staked also. They then took away all their lines except the red quarter and cross quarter lines. A line would then have been strung between the stakes of the octagon and the other eight sided figure. Lugh and the Y and Z holes would just be left as stakes, no stringing required there. In the following diagram, the red lines are the quarter and cross quarter lines. I then put in the black lines, two Aubrey holes away from each red line. Then I put in the blue lines, which sit half way between two black lines, and not on any Aubrey holes. This divides the circle into 32 pieces, and not all the angles are the same, some are larger than others. However, as can be seen, many of the lines are placed along the sides of Sarsen uprights, making me think they must have used this method to place them. I came upon the idea for stringing the Temple after playing with a picture of Thoth. Zecharia Sitchin called this Thoth as the Winged Measurer, but I call it Thoth with the Winged Measurer. It’s the snake that has the wings. A snake can move straight or in a zig zag, and when it rests, it coils up. The measuring cord can be used straight or in a zig zag, and when you are done with it, you would coil it up. It has wings because you can take it anywhere, even across an ocean. Many snakes in Egyptian art symbolize the measuring cord, just another version of the strip of the whale’s back. On the Gundestrup cauldron, the measuring cord is a ram horned snake. Cernunnos has one in his hand. The ram’s horns are connected to the age of Aries, and the bull in the bottom of the cauldron is connected to Taurus. The panels of the Gundestrup cauldron tell a story about astronomy and the calendar at a time when one Zodiac sign was close to changing from Taurus to Aries. Taurus is still alive though, and Aries is not yet in command. Manannan doesn’t seem to have been part of the Celtic mythologies in Continental Europe where the cauldron was made, so no strip of the whale’s back appears, but there is a whale in the panel of Cernunnos. Someone is riding on its back, and this little picture has always been a mystery, but it likely refers back to Manannan. Everything I have discovered at Stonehenge, started with the Queen/Quin/Gwyn stone, and Wodin upside down on the Ash tree. After that, Thoth took a hand. In ancient times it was believed that if you asked Thoth for help, he would help you. When I was trying to draw the Trilithon Horseshoe with Lugh hanging there, I had a very frustrating time trying to get the perspective correct. Since I had been reading about Thoth at the time, I thought, “Well, Thoth old boy, if you’re still around, I could sure use a hand with this”. Half an hour later, I had the drawing done, without once having to change a line or erase anything, so I guess, Thoth gave me a hand, and has continued to do so. Not long after playing with the above picture, I discovered that I am now Ophiuchus and not Sagittarius any longer. Ophiuchus is the Snake Holder, which had me laughing quite hysterically, and yet……………it felt like a stamp of approval, as if Thoth had taken me under his wing. This entry was posted in Ancient History, archaeology and tagged alfred watkins, Lugh, Manannan, Stonehenge, Surveying the Sarsen Circle, Thoth. Ok. You are right. I cannot explain in one sentence or even two why you are. It would take pages. Hence the reason I wrote an entire book. This is the topic of my book. I would send it to you but…it is on paper! Well thanks. Not too sure what I’m right about though. Book? Got a name? Can I get it at the library? Must go read your blog, sounds interesting. It is “One” by B.L. Freeborn. The buy button is on my blog site which goes to Lulu US, the printer, which will ship from the UK if you go to Lulu UK. Amazon US has an interior viewer. Unfortunately, one cannot pick and choose the pages they show. So judge it by the contents not the first twenty pages or so, which is more of a poem. You are correct about the world civilization. It is staring us in the face but for some reason we are blind to it. Since you are evidently completely knowledgeable in British Ancient History, you will probably be screaming, “I knew it.” As I said, you do. I’m not too sure about the ‘completely knowledgeable’, but have been reading ancient history for fifty years. Charles Hapgood came along in the early days of my reading. Since then, it has become obvious that we today know very little about what was going on then. We are blind to it because we think we are so superior, and we’ve always believed in the history we were taught as children. Most folks are too busy with getting on with it to spend much time wondering what went on then. After all, that was then, this is now. We have linear mentality. We went from caveman to modern man in progressive steps, only we didn’t, there were many set backs which we don’t remember, and don’t recognize in the histories, mythologies and folklore. However, there does seem to be a new awakening today, I’m finding more and more people who are starting to see this. We have to stop thinking of the Greeks as the font of knowledge, they weren’t, they just brought that knowledge forward into their time, but it existed long before that. I came across Hapgood more recently. I had to print your post and looked at it over several mornings with tea. So here are a few more comments which relate to other topics we have discussed. We see in the Dulcert portalano (image under the snail) the lines intersecting and fanning out are navigation markings. It is based on the wind system. Without pulling out Hapgood who describes this, their are 16 wind systems and I think it was 12. This method is still used today and an actual how to text on navigation will explain it. Last image of the woman with the outstretched arms. I read Berriman’s “Ancient Metrology” years ago. Over the years as draftsman, engineer, and general fixer-upper, how long?, is repeated all the time. So, just like Berriman, I would run to the origianl image and pull out my measuring tape (in good old inches) and measure it. Yes, I know about the wind systems. Navigators have used this for a very long time, I’d say, long before the Dulcert Portolano. The person with the outstreched arms is actually Thoth, got the picture out of a book. If I knew where the original is hiding, I would have measured it long ago. Always have my ruler and protractor at hand. There’s a great deal of mathematical coding in pictures from Egypt. More comments / questions: I know you have studied Stonehenge thoroughly so in the first image north sort of points to the left at a 45 degree angle. There is a gap in the middle of the inner circle of stones. The figure creates a star there. Pointing from the center stone out through the gap creates a direction, head through crouch, so to say. Of course I am going to ask, do you know what angle, or compass heading this is? Second comment on this image has to do with our 56 Aubrey hole discussion. Notice what your mind automatically does when counting those large inner stones. 12345 where’s six? 12345 why only five? We mentally want to complete the pattern. Since we cannot form a comfortable six we revert to the star pattern. 5 6 5 6 it repeats. It always repeats. The star’s head is pointing SW. Winter Solstice Sunset happens there. It sets between the uprights of the Great Trilithon, which is where his head is connected. I’m starting to think Stonehenge is a giant alidade, the area around it is the plane table with the Aubrey holes being the markings around the outside. 5656 sounds correct, that 5 and 6 connect to those Druids and their calendar keeping. 5 years makes one lustre, 6 lustres makes one month of years, or 30 years. More questions. I am breaking this up so others can follow the discussion… I think… Your lines of light image, fourth image down, correct me if I am wrong. I count 19 stones in the Bluestone horseshoe. Correct? I count only 59 in the Bluestone circle. Correct? With 5/10 creating the center? So in order inside out: 19 5 59 30 29 30 sums to 172. Unless you correct my counting. The Bluestone circle is iffy, no one knows exactly how many there were in that circle. This inside area of Stonehenge is pockmarked with post holes from other constructions they had there. The guess is 60, this would tie in with 5, 15, 30. But it may have been 57, since this is 3 x 19, and the Bluestone horseshoe has 19. Although that has been debated on and off also, at one point it was thought there were 21. It’s difficult in that area since there was once a double Bluestone circle there, although this circle doesn’t seem to have been finished. A little update on the direction of the pointy head. It doesn’t point due SW, it points about 4 degrees W of SW. What was important to them was Sunrise on Summer Solstice, and Sunset on Winter Solstice. They don’t actually sit completely in line with one another. A line from Aubrey hole 28 to 56 and on to post hole 4 gives Summer Solstice Sunrise in 3000 BCE. That’s at 49 degrees + some feet. Today it sits at 51 degrees, 51 feet. The Heel Stone never did have anything to do with Summer Solstice Sunrise, although today it is much closer to the Heel Stone than in 3000 BCE, and sometime in the future the Sun will rise there. This Sunrise will keep moving to the right as time goes by because of the Earth’s rotation relative to the Sun, but it happens so slowly that we don’t notice in our life time. What an enormously interesting article that I would never normally really read, or even find. Fascinating. And the comments helped me understand more. Thank you! Cheers. Thank you. Glad you found it so interesting.